Light-Fidelity is a label for wireless-communication systems using light as a carrier instead of traditional radio Frequencies , as in Wi-Fi. Li-Fi has the advantage of being able to be used in sensitive areas such as in Aircraft and other transportation without causing interference. However, the light waves used cannot penetrate walls. It is typically implemented using white LED bulbs at the Downlink transmitter. This type of devices are normally used for illumination only by applying a constant current. However, by fast and subtle variations of the current, the optical output can be made to vary at extremely high speeds. This property of optical current is used in Li-Fi setup. The operational procedure is very simple-, if the LED bulb is on, you transmit a digital 1, if it’s off you transmit a 0. The LEDs can be switched on and off very quickly, which gives nice opportunities for transmitting data. Hence all that is required is some LEDs and a controller that code data into those LEDs. All one has to do is to vary the rate at which the LED’s flicker  depending upon the data we want to encode. Further enhancements can be made in this method, like using an array of LEDs for parallel data transmission, or using mixtures of red, green and blue LEDs to alter the light’s frequency with each frequency encoding a different data Channel. Such advancements promise a theoretical speed of 10 Gbps – meaning one can download a full high-definition film in just 30 seconds. All of us have increasingly become dependent on the internet some way or the other. It is impossible to think of a day in our lives, when we are not “connected” to the “net”. We are using the internet for a variety of purposes, chief among them being sharing of data. In scenarios where we want to transmit data quickly and efficiently, low internet speeds can be quite annoying. Li-Fi is a new technology which uses visible light for communication instead of radio waves. An application making use of this technology will help us counter many problems like interference issues in RF signals, security issues in Wi-Fi and many more. One of the main advantages of using Li-Fi is that it provides data transmission at very high speed. 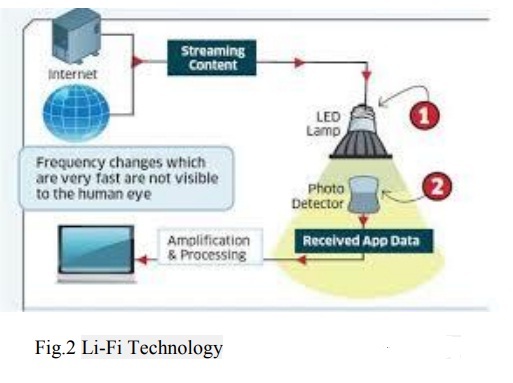 In the paper “Light Fidelity: A Reconnaissance of Future Technology” Dhakane Vikas, et al., there are a lot of advantages of Li-Fi over Wi-Fi. This includes all the features of Li-Fi and the scope of it in near future. Li-Fi is the best and the most efficient way of communication if it is made possible to transmit data via it as described by the paper “Transmission of Data through Light” Rahul R. Sharma, et al. The aspects of Li-Fi are being talked about in “Light Fidelity: A Comprehensive Study” Ekta, et al., which gives an outlook of how the Li-Fi will work basically. The advancements that have been done in Li-Fi for it to overcome some of its limitations and be able to outperform Wi-Fi are discussed in “Recent Advancements in Li-Fi” Akshata M Sonnad, et al. All these references from different papers gives us a general idea of how Li-Fi works and how the introduction of it has encouraged the people to shift their focus from Wi-Fi which uses RF signals for data transmission to Li-Fi which has taken the industry by storm. The prime objective of the project is to create an application that transmits data be it text, audio or video using Li-Fi technology for coping with the limited bandwidth problem we face in RF (Radio frequency) signals. For better, efficient, secure and a faster connection Li-Fi is used. One of the advantages of using Li-Fi over Wi-Fi is that it avoids radiation produced by Wi-Fi. The goal of our project is to transfer data with faster speed which is not easy to achieve through Wi-Fi and see whether transmission is possible through various mediums or not. Li-Fi can be thoughtas an alternative for Wi-Fi which uses light as a medium to transmit data. We aimed at the transmission of data via Li-Fi and all the possible aspects of transmitting data via light through various mediums which will give us a broad idea of where and how we can use Li-Fi for transmission of data. The Li-Fi system consists of mainly two parts, the transmitter and the receiver. LED light is used as signal source between two end systems. Data is carried by the modulated light from the LED. The microprocessor unit (MPU) system modulates and demodulates data at transmitter and receiver ends respectively. The transmitter part modulates the input signal with the required time period and transmits the data in the form of 1's and 0's using a LED bulb. These 1's and 0's are nothing but the flashes of the bulb. The receiver part catches these flashes using a photodiode and amplifies the signal to produce the output. Li-Fi is implemented using white LED light bulbs at downlink transmitter. An array of LEDs can also be used for parallel data transmission and different coloured LEDs to alter the LED frequency so that data are encrypted for different frequency. In our project we first convert the data file to be transferred into a binary stream of 0’s and 1’s which is fed into the Li-Fi TX hardware which transmits this data through light. Intensity of light is modulated to achieve this goal. We set a high threshold voltage as on state and a low threshold voltage as off state. Whenever the LED is in on state it transmits a 1 and when it is in off state it transmits a 0. The switching transistor is capable of toggling the state of led in nanoseconds which increases the speed of transmission to some extent. The Li-Fi RX after sensing the binary stream sends it to the system where the original data file is retrieved. Light Fidelity is typically implemented using white LED light bulbs at the downlink transmitter. These devices are normally used for illumination only by applying a constant current. However, by fast and subtle variations of the current, the optical output can be made to vary at extremely high speeds. This very property of optical current is used in Light Fidelity setup. The operational procedure is very simple-, if the LED is on, you transmit a digital 1, if it‘s off you transmit a 0. The LEDs can be switched on and off very quickly, which gives nice opportunities for transmitting data. Hence all that is required is some LEDs and a controller that code data into those LEDs. All one has to do is to vary the rate which the LED‘s flicker depending upon the data we want to encode. Further at enhancements can be made in this method, like using an array of LEDs for parallel data transmission, or using mixtures of red, green and blue LEDs to alter the light‘s frequency with each frequency encoding a different data channel. Such advancements promise a theoretical speed of 10 Gbps – meaning one can download a full high-definition film in just 30 seconds. To further get a grasp of Light Fidelity consider an IR remote. (fig 3.3). It sends a single data stream of bits at the rate of 10,000-20,000 bps. Now replace the IR LED  with a Light Box containing a large LED array. This system, fig 3.4, is capable of sending thousands of such streams at very fast rate. Light is inherently safe and can be used in places where radio frequency communication is often deemed problematic, such as in aircraft cabins or hospitals. So visible light communication not only has the potential to solve the problem of lack of spectrum space, but can also enable novel application. The visible light spectrum is unused. It‘s not regulated, and can be used for communication at very high speeds. The University of Strath clyde in the UK has created a research center aimed at turning the constant flicker of LED lights into a way to transmit internet communications using visible light, as opposed to radio waves (Wi-Fi, cellular) or via cables. Dubbed, the Intelligent Lighting Centre (ILC), the consortium is made up of researchers from several UK universities, and is backed with £4.6 million (US $7.28M) by the Engineering and Physical Sciences Research Council. Together the consortium aims to conduct research on a smaller LED than other groups around the world that are also investigating this technology. First, a bit on what they call Li-Fi from the university release (or you can go catch a TED talk on the topic):Underpinning Li-Fi is the use of lightemitting diodes (LEDs), a rapidly spreading lighting Technology which is expected to become dominant over the next 20 years. Imperceptibly, LEDs flicker on and off thousands of times a second: by altering the length of the flickers, it is possible to send digital information to specially-adapted PCs and other electronic devices – making Li-Fi the digital equivalent of Morse code. This would make the visible part of the electromagnetic spectrum available for internet communications, easing pressure on the increasingly crowded parts of the spectrum currently being used. Instead of researching Li-Fi LEDs around 1mm2 in size, the EPSRCfunded team is developing tiny, micron-sized LEDs which are able to flicker on and off 1,000 times quicker than the larger LEDs. This would allow them to transfer more information, giving them greater capacity; think of comparable to the difference between DSL  and fiber connections. We found out after the completion of our project that the light that transfers the data from one system to another can also transmit data through various mediums be it water, glass or plastic. The only thing is that we need to adjust the detector in such a way that it can receive the light that has been refracted due to the change in mediums. 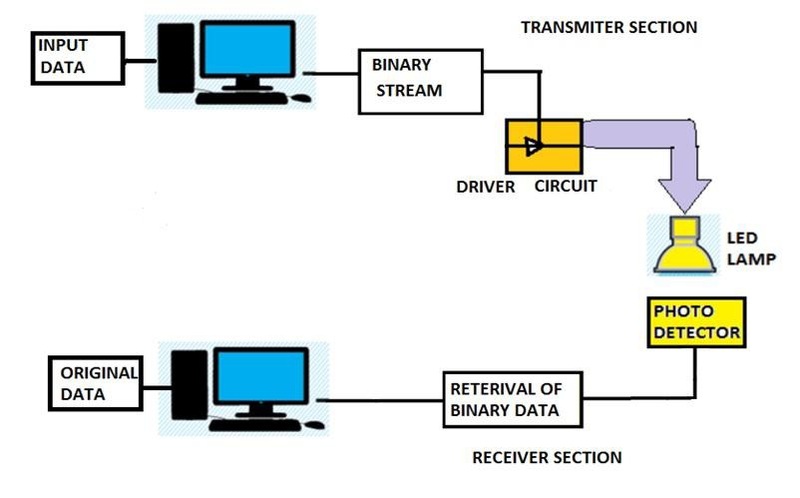 The data is no transmitted, only if we keep an opaque object between the sender and receiver. Also our built system is able to transmit data simultaneously which allows many devices to communicate with each other without hindering the speed of other transmissions. It can also be seen that the intensity of light is to be selected/set properly for being able to receive the data at the transmitter section.  Light Fidelity uses light rather than radio frequency signals so are intolerant to disturbances.  VLC could be used safely in aircraft without affecting airlines signals.  Integrated into medical devices and in hospitals as this technology doesn‘t deal with radio waves, so it can easily be used in all such places where Bluetooth, infrared, Wi-Fi and internet are broadly in use.  Under water in sea Wi-Fi does not work at all but light can be used and hence undersea explorations are good to go now with much ease.  There are billions of bulbs worldwide which just need to be replaced with LED‘s to transmit data.  Security is a side benefit of using light for data transfer as it does not penetrate through walls.  On highways for traffic control applications like where Cars can have LED based headlights, LED based backlights, and they can communicate with each other and prevent accidents. Using this Technology worldwide every street lamp would be a free data access point.  The issues of the shortage of radio frequency bandwidth may be sorted out by Li-Fi.  This research report categorizes the global VLC technology market; based on component, applications, and geography. Li-Fi uses light-emitting diodes (LEDs) which are rapidly gaining in popularity for standard light bulbs and other domestic and commercial purposes. They are expected to be ubiquitous in 20 years. VLC is not in competition with Wi-Fi, Prof. Haas says, it is a complimentary technology that should eventually help free up much needed space within the radio wave spectrum.  The Problem is that light can‘t pass through objects, so if the receiver is inadvertently blocked in any way, then the signal will immediately cut out. ―If the light signal is blocked, or when you need to use your device to send information — you can seamlessly switch back over to radio waves‖, Harald says.  Network coverage and reliability and are the major issues to be considered by the companies while providing VLC services. Interference from external light sources like sun light, normal bulbs; and opaque materials in the path of transmission will cause interruption in the communication. 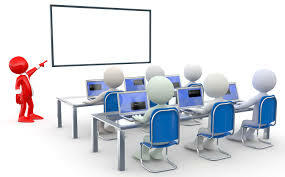  High installation cost of the VLC systems can be complemented by large-scale implementation of VLC though Adopting VLC technology will reduce further operating costs like electricity charges, maintenance charges etc. The scope of Li-Fi is vast. Li-Fi is an emerging technology and hence it has vast potential. The area of Li-Fi is very broad in the manner of hospitals, academics, airlines and more. It can be used in the places where it is difficult to lay the optical fiber like in hospitals and nuclear power plants. In operation theatre, Li-Fi can be used for modern medical instruments. In traffic signals Li-Fi can be used. We can communicate with the LED lights of the cars and reduce the traffic congestion by implementing thousand and millions of street lamps to transfer data. In aircraft, Li-Fi can be used for data transmission without interfering with radar communication. A portable Li-Fi can be brought into existence using the said principles, with which we can transmit and receive data at very high speed rate. This can be used in a smart phone which has a photo detector in it. Consider a series of LEDs in the smart mobile nearer to the light detector and as how a Wi-Fi option is provided in the mobile, if an option known as Li-Fi is present, if we turn it ON the LEDs which are placed nearer to the light detector which is working as a normal LED on the phone will start acting as a portable Li-Fi where these LEDs will do the operations as mentioned above and the photo detector which is in the mobile will sense it and data will be transmitted in which ever place we are. The possibilities are numerous and can be explored further. If this Li-Fi technology can be put into practical use, every bulb can be used something like a Wi-Fi hotspot to transmit wireless data and we will proceed toward a cleaner, greener, safer and brighter future. The concept of Li-Fi is currently attracting a great deal of interest because it may offer a genuine and very efficient alternative to radio-based wireless. As growing number of people and their many devices access wireless internet, the airwaves are becoming increasingly clogged, making it more and more difficult to get a reliable, high-speed signal. This may solve issues such as the shortage of radio-frequency bandwidth and allow internet where traditional radio based wireless isn’t allowed such as aircraft or hospitals. One of the shortcomings however is that it only work in direct line of sight. In our project we have examined the different areas where Li-Fi can be implemented for data transmission and observed that the only shortcoming it has can be overcome by introducing a false ceiling concept where we can have a broader area for communication with increased line of sight. Jitender Singh, Vikash ―A New Era in Wireless Technology using Light-Fidelity‖ International Journal of Recent Development in Engineering and Technology ISSN 2347- 6435(Online) Volume 2, Issue 6, June 2014.